There are many important questions in life: Who are we? What is our purpose? Are we alone in the universe? Did Axl Rose ever get some reggae? In case you have yet to ponder that final question, maybe we should explain. As you are probably aware, the aforementioned Mr. Rose has spent the bulk of his adult life (a brief spell in AC/DC aside) as the lead singer in the wild but phenomenally successful rock band Guns N’ Roses. Theirs is not a name that you would normally associate with reggae. In fact, you would be hard pushed to find a link between the two. The band have toured the world several times and released a whole host of merchandise from kitchen aprons to beach towels, and they even have their own video slot game over at Voodoo Dreams. They also dabbled with punk music on 1993’s ‘The Spaghetti Incident?’, but they have never been directly associated with the genre of reggae. 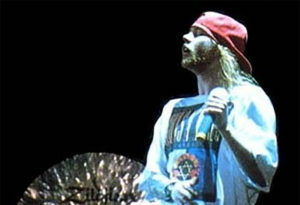 However, way back in 1992, while performing a cover version of Bob Dylan’s ‘Knocking on Heaven’s Door’ in Tokyo, the enigmatic frontman screamed the immortal line “Give me some reggae!” The tempo and rhythm of the song switched and Axl Rose began cartwheeling around the stage in an exaggerated manner. This incident raises its own set of questions. First, was the band actually playing reggae? And second, what the hell was that dance? So, let’s deal with the reggae question first. The call for reggae was greeted with something that, while clearly different from the usual pace of the song, could hardly be described as reggae. You could argue that the section was inspired by elements of ska and British two-tone, but it was far too manic and upbeat to be classed as reggae. But the band should at least be given 10 out of 10 for effort. Exactly what prompted this ska/rock mashup of a Bob Dylan fold song is unclear but at the time, the band were experiencing some turmoil following the departure of some band members and were in the middle of a 28-month world tour in which they performed 194 shows. They obviously felt the need to add a bit of variety to their set during this time. So in answer to the original question: Did Axl Rose ever get some reggae? The answer has to be no, Axl Rose didn’t quite get the reggae he asked for, but he did get a rocked out ska track that would later kick off an online video phenomenon. Not a bad consolation!